Have you ever been desperate to smock and thwarted in the effort? Desperate to stitch hand embroidery and been hampered? Desperate to sew in a power outage? I bet the answer is yes. It reminds me of my crazy friend Catherine who, 25 years ago, had taken her boys to the beach. Settled down in the sand on an old quilt, under her beach umbrella, she pulled out her smocking only to discover that she had everything but a needle! Desperate, like me, she walked up and down Daytona Beach asking each sunbather if she might have a #7 crewel needle that Catherine could borrow or buy. That, my friends, is desperation. To no one’s surprise but Catherine’s, she came up empty handed. How this bubble came to be is a result of such desperation. It didn’t turn out as planned, it didn’t turn out great, it didn’t really please me. But it did scratch my itch for some form–any form!– of needlework. The ruffles are too skimpy. With my dream-come-true sewing room, I should never have been in this position. But it happened. And here’s how. We left a day early for our week in the mountains, with just 45 minutes to pack. As we watched the weather channel, we could see that Tropical Storm Andrea was scheduled to deluge the eastern coast from our home in central Florida all the way to our cabin in western North Carolina. So we decided to leave ASAP and that boiled down to 3/4 of an hour. In that kind of rush, I was lucky to grab up clean socks and underwear. I had planned to spend those leisurely days smocking a few things for baby Vivian Rose and a few more for 9 year old Laurel Cade. Of all the projects I had lined up to prepare, only this ready-to-smock Martha Pullen bubble was actually ready to smock. Earlier, my Brother Quattro, a fabulous heirloom machine, made it a breeze to apply the entredeux and tatting. A few precious packing moments were spent selecting a smocking plate (Gwen Milner’s delicate Carousel Horses) and gathering up the necessary skeins of floss. After I parked myself on the quiet side deck, I began smocking this straight yoke design onto a round yoke bishop. But darned if those dainty horses didn’t turn into short legged draft horses—UGLY!!! FYI, the smaller the round yoke, the more distorted picture smocking becomes. So what now? I had only the floss for the carousel horses and one other plate (below) which was on the opposite side of the page protector. Fortunately, I could make this plate work. Given my limited palette of floss colors and the need for a round yoke design, I really lucked out. Adding to my stress was worry that I would run out of smocking before I ran out of days at the cabin. I had just one small project for 10 days! The only recourse was to read a lot and spend more time on SewForum, Martha Pullen’s Forum, Pinterest and facebook. It was a desperate time, I tell you. The other glitches had to do with the modifications I had to make after we returned home. 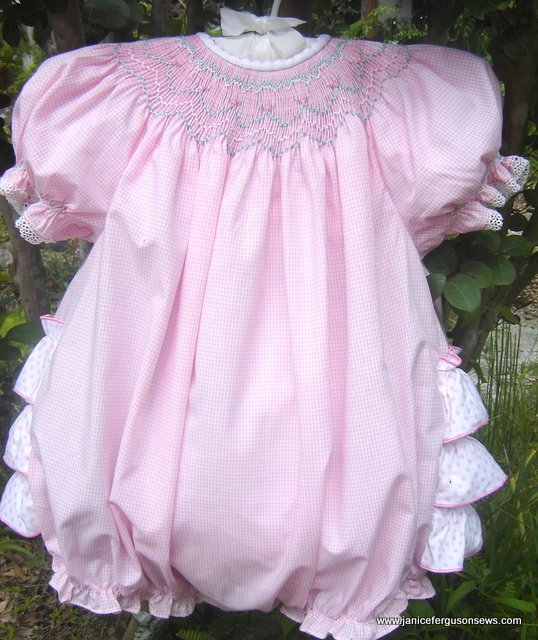 Remember that my daughter gave me only two directives about clothes for Vivian Rose: 1. any color was okay so long as it was pink–light pink, dark pink, medium pink, pink stripe, pink print, pink whatever, just so long as it was pink, and 2. ruffle bottoms were required. 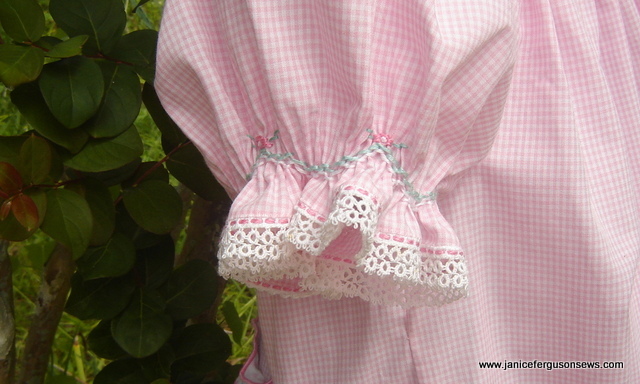 I had no matching pink gingham for the ruffles and plain white didn’t suit me. Using a print seemed to demand that the print be incorporated into another component of the bubble. 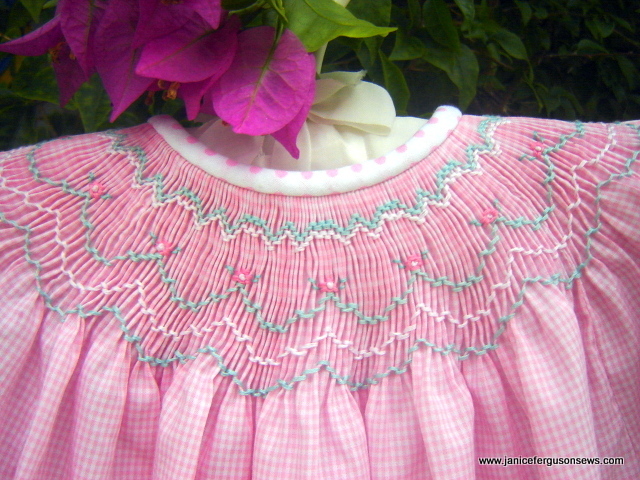 This pink polka dot cotton seemed to be good enough for both the ruffles and the neck bias, which was applied right on top of the existing gingham binding. None of my serger thread was quite the right color so I resorted to using Mettler and DMC cotton threads, which were in short supply. In an effort to be certain that I did not run out of thread, I reduced the width of the ruffles to 33″—way too short for the 22″ width across the bubble back. Oh well. I did not have to sit out on the deck in the cool mountain air reading instead of smocking. And Vivian Rose does have another pink outfit to wear. Have you ever been desperate? Tell me about it. Maybe I will feel better about this desperation bubble. 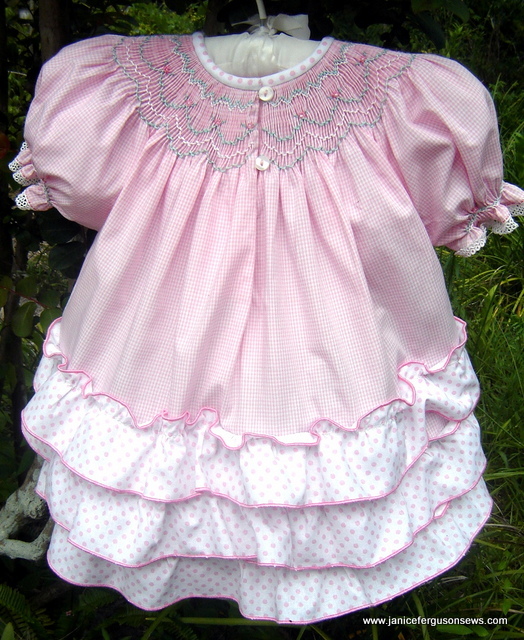 This entry was posted in heirloom sewing, infant clothing, ready-to-smock finished projects, smocking and tagged ready to smock, smocked baby bubble, smocking. Bookmark the permalink. It looks good to me!! I don’t see any problems. I just love the ruffles, they are not at all skimpy to me. Also, the horses do not look bad, they are picture perfect – like they are galloping!! 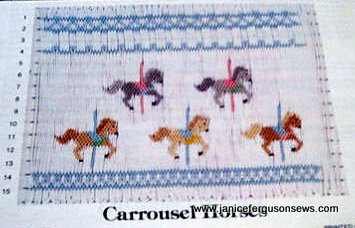 Thanks, Rochelle, but I didn’t smock Gwen Milner’s gorgeous horses but used an Ellen McCarn plate instead. I’m glad you don’t think the cotton ruffles are too skimpy. At least, they will be easier to iron. LOVE it! Ruffles look fine to me! Janice, it is precious. You could have fooled me. I would have thought you put weeks into designing this precious ruffled bubble. Typical Janice beauty! The ‘Desperation Bubble’ came out beautifully. The smocking is gorgeous on it. Yes, I had a desperation garment for my Victoria-Rose. For an Easter Dress when she was in preschool I wanted to make her the puffing dress on the back cover of one of the first Fancy Work magazine’s but I wanted to add shadow work bows and bullion roses like the Wendy Schoen baby dress in the same issue (I think). I got the fabric & lace and completed all the embroidery and then went to put it together. I just could not get the puffing to look right and kept doing it over and over. I gave up. It was Good Friday and I couldn’t sleep knowing that I had NO DRESS for my Rosebud! As I lay there, I started mentally inventorying all my heirloom supplies and came up with a plan. I got up and sketched out a dress of pink batiste and laces (many types/styles) with a full skirt, a lace shaped lace heart on the bodice. puffed sleeves, and lace edged tie sashes. The next day and early Easter Sunday morning I completed the dress and she looked lovely. I used vintage beauty pins to close the back for there really was no time for buttonholes or buttons! I did use the embroidered pieces of white batiste from the planned dress to make a white dress for her a couple of years later (but without the puffing!). Talk about stressed out! I was a mess until that dress was finished! Goodness! I must be REALLY wordy. I thought I told a short story! Are you kidding me? This outfit is A.DOR.ABLE!!! I love it. Oh it is a standing joke around our house how i was always finishing up something to take on vacation to smock. One year i was trying to sew beach coverups for my twin girls, the towel ones with applique and ribbon, and i was still stitching while they were all loading (maybe that wasn’t a bad thing). Another time i had just finished smocking my girls dresses for Easter but they were going to first wear them for photos for our church directory but I didn’t have time to hem them. So they wore them not hemmed. Thankfully none of that shows in the photos anyway! And of course staying up until 3 a.m. to finish 2 dresses and smocking an insert for my son’s sweatshirt for their photo shoot the next day. Sigh… And they probably don’t remember or care about any of those times ( : It’s all good! Thanks, Linda. I surely wasn’t trying to fool you–this was made by the seat of my pants, with the smocking plate and floss available at the time. Janet, I’m really glad to hear that. They would have been much fuller than 33″ if I hadn’t worried about running out of DMC and Mettler cotton thread that I used for serging. With all the problems I had had, I surely didn’t want to run out of matching serger thread after serging both sides of two and a half 45″ ruffles. I loved reading about your Easter dress panic. I ached in sympathy! But please don’t ever abbreviate your comments for me! Oh, Rhadonda, I have been there and done that! I loved reading about your experiences. Stitching up to the last minute is a habit of mine and others of the same ilk. We are driven. I even wrote a post about that–we simply MUST do these things. It’s in our DNA. All I can say is I hope my “planned” garments turn out half as well as your “desperation” ones! I think the bubble is adorable! Thanks, Dorothy, but I’m certain that all of your garments are lovely. Love the bubble!! I think it is adorable! My best desperation story is when I was VERY pregnant with my first little girl. I was frantically trying to finish a white batiste smocked day gown and matching bonnet for my baby girl to wear home from the hospital. I choose the Anna smocking plate for it’s daintiness and sweet feminine look. Never having tackled bouillon roses before, which the Anna plate is chock full of, Though i was working as fast as I could on my creations, I knew at this pace I was running behind on my gown and bonnet. I was scared I wasn’t going to be through by my due date. So, alas! My husband who travels with his job asked me to join him on a business trip to California. It was our last getaway before we had children. Perfect, I thought…the 4 hour plane ride to and from CA would be a perfect time for me to make some headway on those bouillon roses! So, I pack up my smocking kit with all the floss, garments, and needle and small scissors to board the plane. Realizing at check-in when my husband kindly informed me that “smocking” scissors, though small and non-threatening in appearance, were not allowed on the plane. So, In desperation, I quickly snipped several strands of floss, threw my scissors in my suitcase which was to be checked, and hoped that I got through security with my needle and thread! Wow, Courtney! That’s a story of true desperation and pressure! Though I was desperately worried that I wouldn’t have enough smocking to last the week, your desperation was far greater. You HAD to finish that daygown and bonnet for your sweet baby. That was quick thinking to cut some lengths of floss. I bet you’ll remember that every time you see the picture of her wearing her coming home outfit. Thanks for sharing. Desperation outfits usually turn out better than the ones I spend weeks trying to plan! I could argue with you because everything you make is so spectacular. But thinking back to your girls’ Easter dresses and how you put together old, unused inserts and great fabrics for those dynamite sundresses and how you used the armhole cutouts for doll bodices–you’re good with long term planning and also under the gun. “A happy accident” sounds so much nicer than “Desperation Bubble.” I’m going to use that phrase from now on. 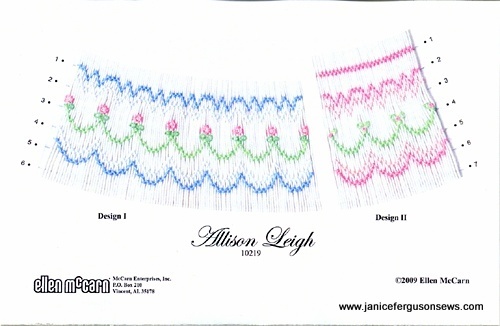 You will enjoy that smocking plate–it’s quick and easy and very pretty. So often I bemoan the tendency of so many shops to discontinue products for smocking and heirloom sewing. Thank goodness for places like Farmhouse Fabrics and Martha Pullen Company. I called the store to ask her a question or two and she told me to check out Martha Pullen for ready to smock dresses. I am so excited. I CAN sew. But it really is a joy robber for me. Of course I know I will have to start sewing soon or inherit a boatload of $ because as little one grows I won’t be able to find clothing that fits well with her square frame due to Down Syndrome – plus I like my girls to look little as long as possible. Anna, the ready-to-smock from Martha Pullen has really helped me get more smocked garments on my grandbabies. But down the line, sewing for Grace will be the best way to keep your little one looking her best. There are so many fabulous patterns available. I look forward to seeing what you create for her to wear. Oh. My!!! Do you make these to sell??? Beautifullllll! No, Christy,I don’t do custom orders. At this time in my life, I can hardly keep up sewing for my 4 grands. But thanks for asking. Pamela, I have none for sale. I suggest you contact Esther Conrad Grant at TigerSwallowTales. Her work is legendary. I would love to buy one of these!! Is there a way I can? Terrie, I’m glad you like this but this is no longer for sale. A precious family friend is awaiting the birth of her first child and if it is a girl, it will be hers. If not, it will be for sale. The baby is due Dec. 1 so the bubble may be posted for sale after that. Thanks for asking.